We think of dental implants as a modern solution to missing teeth—and for dental implants as they are now, that’s true. But there’s also evidence to show that, throughout history, people have been bridging gaps in their smiles with a wide variety of materials. Some of the earliest evidence includes a 1,300 year-old mandible found among Mayan ruins. Specially shaped shells had been implanted into the jaw to replace missing teeth. Evidence from ancient Rome and ancient Egypt has also been found. In the case of Rome, a cast-iron implant was found in the jaw of a Roman soldier, while it’s believed that gold wires were used by Egyptians. Other materials that have been used throughout history include ox bone, semi-precious stones, copper, ivory, and rubber. The first contemporary implant was placed in 1965. Through a test with titanium and a rabbit femur, the scientist Per-Ingvar Brånemark discovered that titanium could form a bond with bone tissue, which led to the placement of the first implant in a human skull. Today, dentists like Dr. Goldstein of Randolph Dental Care are restoring smiles with dental implants on a regular basis. 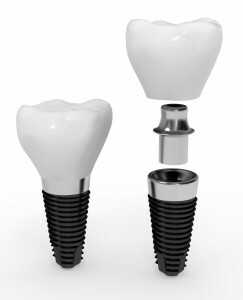 Dental implants mimic the natural structure of teeth with a crown on top and an implant, which acts as a prosthetic root, underneath. They’re versatile enough to replace a single tooth, multiple ones, or even an entire row. Best of all, Dr. Goldstein’s Randolph dental patients can have both stages of an implant procedure completed right in our office. Are dental implants the right restorative service for you? During a consultation at Randolph Dental Care, Dr. Goldstein will talk to you about the dental implant process and recommend a personalized treatment plan, whether it involves dental implants or another service entirely. Call us today to reserve your appointment. We serve patients from Randolph, Rockaway, Mendham, Chester, Morristown, Denville, Morris County, and beyond.